Oakland Self Storage at 300 Market St. Located on Market St. between Fourth St. and 3rd St. just south of I-880, Extra Space Storage serves Oakland residents near Acorn, Old Oakland, Lower Bottoms, South Prescott, Oak Center, Uptown, and Chinatown. Locals will recognize our facility near Venga Paella, Team Efforts Company, and Johnstone Supply. We're also accessible for residents of nearby apartments, such as 5th Street Lofts, Mohr 1 Apartments, City Towers Apartments, Courtyards at Acorn, Acorn Apartments, and The Ellington. Extra Space Storage is 1.3 miles from Lincoln University, making us an accessible option for college students who need self storage over the summer or while studying abroad. 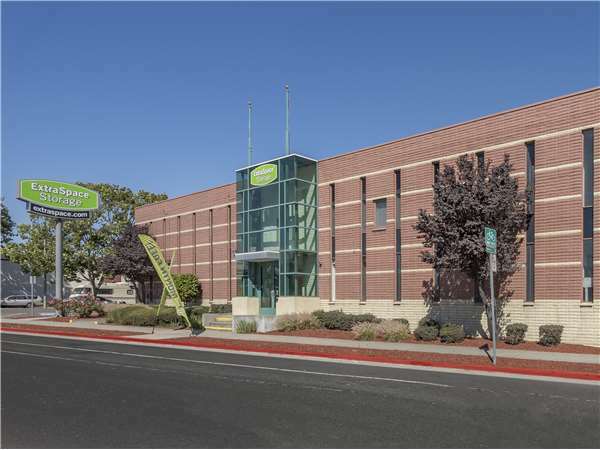 With a large selection of storage units and exceptional security, Extra Space Storage on Market St. is the self storage solution you're looking for in Oakland. Our Market St. storage facility offers storage unit sizes from 5x5 to 10x30. Units come with features like indoor access, first-floor access, and elevator access, providing plenty of options for both residential and commercial storage needs. Not sure which unit size is best? Contact our staff, and they'll help you! At Extra Space Storage, we go above and beyond for our customers. That includes providing a secure storage environment. With security features like an on-site resident manager, 24-hour video surveillance, individually-alarmed units, and electronic gate access, you can rest easy storing your belongings with us. We believe Extra Space Storage customers deserve the very best. That's why our facility is always clean, secure, and well-maintained, and our friendly, professional staff is committed to helping you find the best storage solution for your needs. Contact us today to reserve a storage unit in Oakland! This facility is very useful, clean, friendly and close to my location of where I previously moved from. I don't like how the prices change every 6 month's & go up. I need a place to rent, to live in & rent not storage rates rising! Extra Storage Space is a Great Facility!!! Try it ???? Extra space storage is the way to go! Nice staff, clean facility, and late access are all the reasons why I decided to rent a unit here. Extra Space Storage is awesome. I've stored eith them everytime I've been in between aparments, or whenever I've needed some temporary extra storage. The customer service, quality of the sites, and pricing are all stellar. If you need storage quickly ExtraSpace Storage id your spot. I've been with them for8 years and have had different storage needs over that time. They've met those needs. The workers are friendly and warm and take extra time to make sure you get what you need. The place is also clean and secure. It is economical, clean and convenient. I rented with Extra Space Storage before and presently renting a unit. The location in the Jack London Square area is centralized and convenient for me. The paperless electronic sign up process was very quick and efficient. The customer service very professional. The two agents I was dealing with went above and beyond with customer service. Even when the office was closed and I couldn't make it in any other time, one of the agents arranged a time for me to pick up my key. They've been helpful, reliable and very friendly and understanding!! I have moved a LOT and have much experience with storage units. This one gets a rave review from me. I love the location - easy to get to and in a secure environment. It is also clean and well-maintained inside. Further, I do not have to deal with panhandlers outside, and parking/unloading works really well. Property Manager Tanya is always on top of things and knows what she is doing. She's also friendly and very helpful, as is Reggie who also works there. I am in and out of the facility on a regular basis and have yet to find anything to complain about. Thanks Tanya and Reggie!! I found this site online, I called and spoke with the staff member. I was treated so well and taken care of. Everything was explained clearly and professionally. I would and have recommended other friends and family members of mines to this facility. Thank you ever so much for all all of your help. This is the second time I've used this location of ExtraSpace storage. The service is great, the facility is clean, and I feel like my stuff is secure. Also, the staff helped me find people to move my things into my storage (at a very reasonable price), because they knew that I was moving my entire apartment by myself. I would definitely use this storage again. ExtraSpace Storage has made everything in about moving and storage easy. Access from 6:00a to 10:00p is great and no hassle gaining entry with an easy to remember electronic code. Having storage space made my move so much easier. The on-site staff was pleasant and courteous; they offered assistance and suggestions with my particular concerns. I was very pleased with the Oakland - 300 Market Street facility; it is very clean and has equipment in view upon entering. There are 3 hand trucks that have come in handy. I can park my car inside and unload..great feature since I am a female and want to feel secure. In person service is very good except: WHEN I first rented space, the light in the unit did not work. I reported it. Nothing happened 1st month. I emailed second Month for it to be fixed. I left key and was told it would be fixed and I would receive an email. Never got it. Still don't know if it's fixed. When I First rented the unit, I signed up for Emial reminder to pay rent. Never received one. I reregistered on line when I went in to pay 2nd months rent in person. So, two things missed that are fairly important. there has been alot of new faces here but the change is good. The new gals Shirell and Tanya were fun and helpful, I would completely recommend this storage facility on top of any other. I have been storing my things there for a couple of years now and this is the best experience yet. They also keep the facility really clean and they have big smiles when you walk in the door. Extra Space Storage on Market St. is the place to go! I am a return storage space renter to this facility. The storage space is clean and easy to navigate. The staff is friendly and helpful. I rented from this facility from 2005-2009. There were several Management Teams and this is the best condition that the facility has been in for quite some time. I would recommend this facility any day to any one. I made an online reservation with extra space storage and when I went into get my unit # and FREE lock they threw in, the lady who helped me out was totally awesome and helpful! Her attitude really helped me! I've only provided one Internet review in my life prior to this review of Extra Space Storage in Oakland CA. They are the best I've ever rented storage space from and I have rented storage space in Oakland for years. It's the hours, stupid. I can get in and out of there earlier in the day and later in the day than anywhere I have ever rented storage space. They open before I am even awake but I can get in there untill ten oclock at night any day and that is unheard of regarding any storage space in Oakland CA that I am aware of. Their rates are as low as any I have found anywhere in the Oakland East Bay area. Extra Space Storage in Oakland CA is the best I have ever found for convenience and cost with no compromise. Thanks, Extra Space Storage in Oakland! The hours are great for people who don't have much time. they open really early and close at 10pm. The storages are clean and maintenace keeps it that way. Becareful if you have a unit on the 3rd floor. Pay attention on how you will get to your unit. I spent over an hour trying to find mine. The building is designed to with a 2 separate 3rd floors. There would be the left side 3rd floor and the right side 3rd floor. You can't just walk from one side to the other, you would have to go down to the first floor, walk to the other side then go back up. I would say security is good because you need a gate code to get in and you can park your car inside so you won't feel worried trying to get into your car. As far as service, well you will probably only deal with these people twice- once when getting a unit and second when leaving the unit, three if you pay your bill onsite. Service isn't the greatest but at least you don't deal with them everytime you visit your storage unit. The Market Street facility is where I house my belongings and for the most part it is clean and very well lit. The building is nicely painted inside and out and well maintained. The inside is well lit with adequate lighting, the walls and unit's doors are painted white to help enhance the hallway lights. I love the fact that the hallways are not dark, because sometimes I visit my unit after the sun has gone down and I am still able to have adequate light to see inside my unit, as well as to feel safe that I am able to see from one end of the hallway to the next. The concrete floors also help to add light and warmth with the shade of light gray. The concrete floors allow easy access for the carts to roll from the loading dock to the unit. The large warehouse building is secure and I do feel at ease to have my belongings stored there. Facility is clean and secure. Hours are limited, and price is quite ezpensive. Exceptional Customer Service staff. Cerina and Oliver could not be more helpful. Facility is spacious, conveniently located, near JLS in Oakland. Terrific solution for storage requirements. Check this facility out. You wikll be pleasantly surprized. Guaranteed. TAKE I-80 SOUTH TOWARDS SAN JOSE ONTO 880 SOUTH TOWARDS ALAMEDA/SAN JOSE. TAKE THE FIRST EXIT ALAMEDA/BROADWAY. AT THE BOTTOM OF THE RAMP MAKE A RIGHT TURN ONTO 5TH STREET. STAY IN THE RIGHT LANE 2 LIGHTS TO MARKET ST. MAKE A RIGHT. WE ARE 1 BLOCK ON THE LEFT SIDE. GO 880 NORTH TOWARD OAKLAND. TAKE THE MARKET/ 7TH STREET EXIT. AT THE LIGHT TURN LEFT AND GO UNDER THE FREEWAY. GO TO 4TH STREET AND TURN LEFT AND THEN TURN RIGHT INTO THE 1ST DRIVEWAY. TAKE 980 WEST TOWARDS DOWNTOWN OAKLAND. TAKE THE 12TH STREET EXIT. MAKE A SLIGHT LEFT ONTO BRUSH STREET STAY ON BRUSH AND GO UNDER THE FREEWAY. TURN RIGHT AT 4TH STREET. GO TO THE 1ST DRIVEWAY ON THE LEFT.